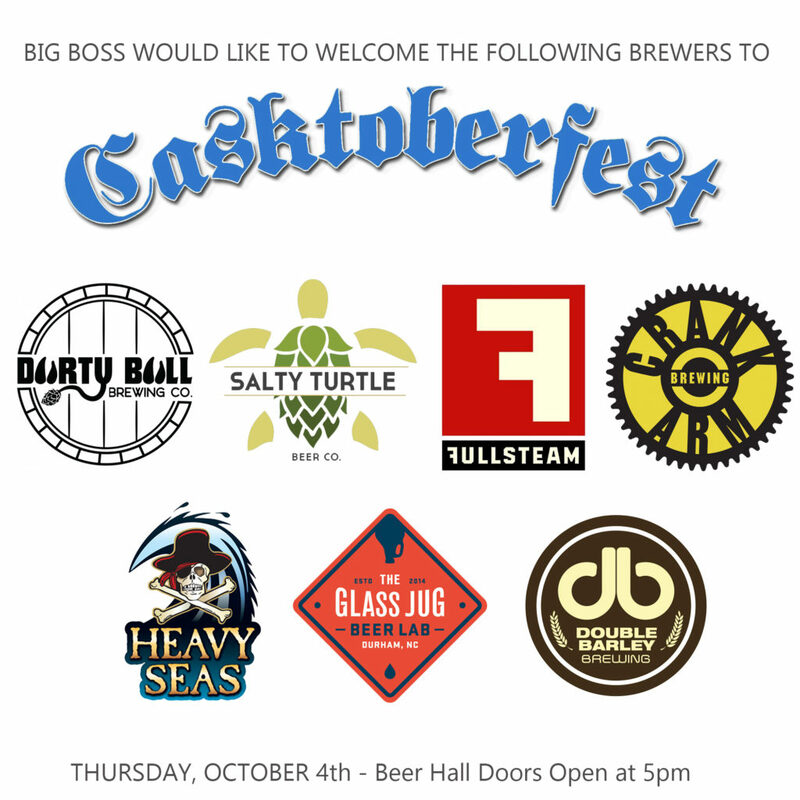 Casktoberfest 2018 will feature several one of kind beers created especially for this event in a festive beer hall style atmosphere! October 4th, happens to be National Taco day so we are excited to have tacos on the menu in addition to traditional bratwurst and pretzels! We have many guest brewers to be confirmed later this week! The brewery beer garden doors at 5pm! Beer hall style seating available! Food menu from catering works featuring bratz, tacos and pretzels! There are no tickets required to get in! This is a pay as you go event. Simply find a menu when you come in, find abeer you would like and order it! Cash will make lines go quicker! Yes! 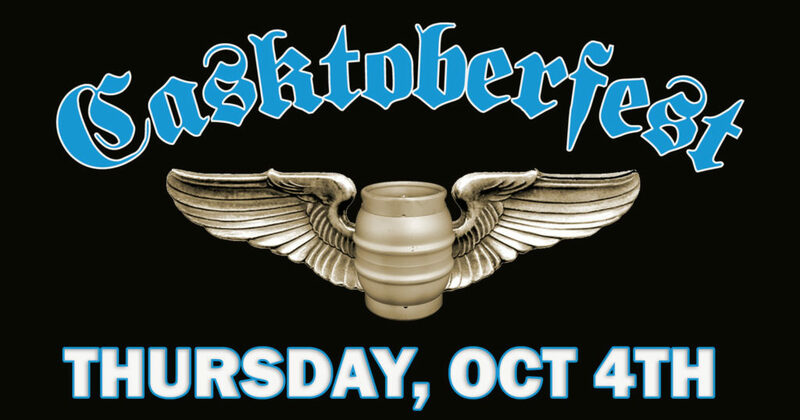 You may bring your Casktoberfest mug from year’s past! Limited amount of mugs available at the bar. 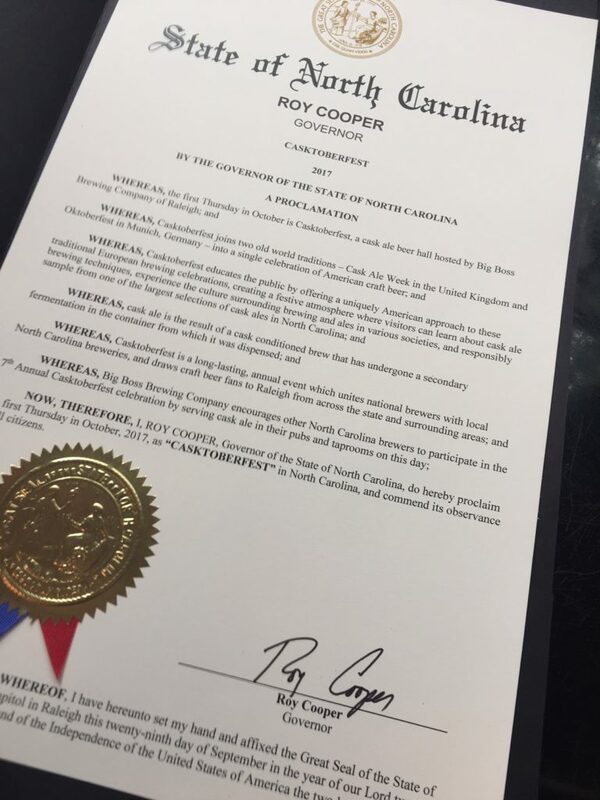 Guest breweries include Durty Bull, Fullsteam and The Glass Jug from Durham, Crank Arm in Raleigh, Double Barley in Smithfield, Salty Turtle from Surf City and American cask ale evangelists Heavy Seas from Baltimore. Parking is tight here in the warehouse area of Raleigh. Making it worse that usual is a construction project at the corner of Laurelbrook and Atlantic. Please be mindful of our local businesses and not block their entrances. Car-pooling is a great idea! Big Boss Brewing receives proclamation for Casktoberfest!